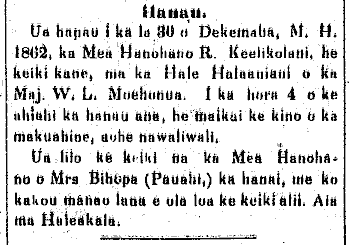 Born on the 30th of December, 1862, was a son by Her Highness R. Keelikolani, at Hale Halaaniani of Maj. W. L. Moehonua. At 4 in the afternoon was the birth; the mother is in fine health without weakness. The child has been given to Mrs. Bishop (Pauahi) as a hanai, with out hopes that the royal son lives a long life. They are at Haleakala [the residence of the Bishops]. Ka Hoku o ka Pakipika, Buke 2, Helu 12, Aoao 2. Ianuari 1, 1863.